Situated in Karachi's main upscale restaurant and shopping district, Fuchsia offers a new concept menu comprised of flavorful Modern Thai cuisine with an artistic twist. Dishes are served "tapas style", allowing for a variety of dishes to be enjoyed by all, while unlimited white rice is continuously brought to your table in a traditional Thai basket. 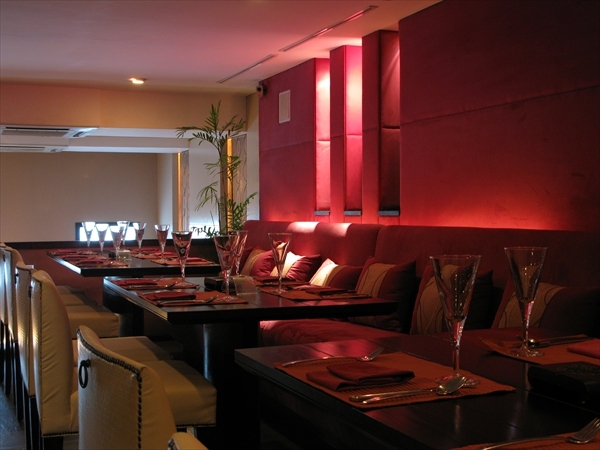 The luxurious ambiance of crimson colored décor sets the mood for an exotic and memorable fine dining experience. Fuchsia’s top Chefs, Kelvin Loke from Singapore and Chef Pairoj from Thailand, join together to bring you authentic flavors from the Far East. The Chef De Cuisine, Mr.Pairoj Ruengsiridet has 25 years of experience in Thai food. He incorporates traditional methods of preparing authentic Thai spices and tastes which capture the real essence of Thai cuisine. The Director of Kitchens Mr.Kelvin Loke brings his expertise in gastronomic food from fine dining restaurants such as The Raffles Grill. He has also worked alongside Michelin-Star Chefs Jacques Pourcel, Anne Pic, Charlie Trotters, Roy Yamaguchi, Rocco Dispirito and many others. He has acquired various awards of recognition and participated in international culinary events such as the World Gourmet Summit. He has trained at Le Muses, one of the most prestigious restaurants in Paris at the Grand Hotel Scribe. Whilst there, he was also given the opportunity to display his culinary flair of merging classic French-European cuisines with cosmopolitan Asian styles at the Paris Le Cordon Bleu 2004, Gastronomic Tour. His innovation and culinary skills promise even more for those who dine at Fuchsia. Ethnic products such as lemongrass and balachan are imported from Dubai & Bangkok and are crucial to the authentic preparation of the dishes at Fuchsia. In addition, sauces and pastes are made from scratch using the highest quality imported ingredients. Spices and herbs are ground the old fashioned way using a pestle and mortar. No artificial ingredients, flavors or added MSG (Chinese salt) are used in any of the dishes. Some of Fuchsia's exotic and flavorful Thai dishes include Steamed Seabass with Chili & Ginger Crust with Lemon Balm Infused Dashi Stock with Lemongrass, Steamed Prawns with Ginger and Garlic & Lemon Chili Vinaigrette, Creamy Red Thick Curry of Chicken with Lime Leaf and Red Chili and in desserts, Toffee Glazed Crispy Banana Fritters with Vanilla Sauce and Thai Tea Ice Cream. A variety of DimSum is also available on the menu which is unique to Fuchsia. Fuchsia uses the freshest, top quality ingredients for thier dishes, paying special attention to balanced flavors, textures, presentation and hygienic food handling practices. All ingredients have to pass an inspection before being placed into a temperature controlled walk-in refrigerator. Any items which are not up to Fuchsia's high standards are immediately rejected. At Fuchsia, you are assured of an extraordinary experience that blends spectacular architecture interspersed with the finest Thai cuisine, luxurious surroundings and a modern touch, all embellished with top-class service. We look forward to your arrival at Fuchsia. Private Dining Room: The Private Dinning Room accommodates up to 12 persons and is ideal for private meetings, small parties, working lunch and corporate dinners. Special Features: Special customized menus available with advanced notice. No added MSG (Chinese Salt) is used in a any of Fuchsia's dishes. Fixed printed menus available for tables of 15 or more. Catering: On and off-site catering is available for a variety of events. Sit-down dining for up to 50 persons and buffet events for up to 400 persons. Customized & special menu requirements also available. Reservations: Preferred. Walk-in also welcome. Reserved tables are held for 20 minutes. Non-Smoking Section Available: Entire main floor designated for non-smoking parties. Smoking allowed on upper floor. Children welcome in non-smoking area. Modern Amenities: Air purifier used in smoking areas. Special Discounts: Standard Chartered, Habib Bank Limited, Faisal Bank and HSBC cardholders get 10% to 25% off their bill. Please call the restaurant for more details. What's New? Exciting menu items added regularly. Lahore location coming soon! What to Expect: Impressive architecture and decor, flavorful authentic Thai cuisine, hygiene consciousness. Plus, highly skilled international chefs viewable through the over-sized kitchen window. An overall enjoyable experience with family, friends or out-of-town guests.